PORTLAND, OR--(Marketwired - Jan 6, 2015) - Investing in the rapid growth of Ruby Receptionists, the voice of small businesses across the nation, Updata Partners has acquired a majority share of the receptionist services company for $38.8 million with co-investment from StepStone Group. Supporting its dramatic success, Ruby Receptionists has doubled its revenue and number of staff over the past two years, delivering live virtual receptionist services to thousands of small businesses throughout North America. Ruby will leverage the investment to continue to accelerate, evolve and expand its proprietary software and highly personalized service offering for small businesses. "From our personalized services to award-winning culture, the team at Updata understands what makes Ruby so unique and successful," said Jill Nelson, CEO and founder of Ruby Receptionists. "They have an impressive track record of helping technology companies innovate and grow, and we're excited to bring their wealth of experience to Ruby as we continue to evolve our world-class service for our clients and their customers." 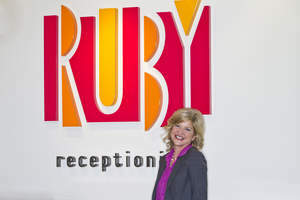 Founded in 2003, Ruby is the ambassador of first impressions for small businesses throughout North America, leveraging proprietary software to empower its staff to create meaningful connections with every call. With two offices in the Portland area, Ruby is dedicated to creating a positive, empowering workplace that enables staff to succeed from its Smile File to "Five at Five Sabbaticals," WOW Station and in-house fitness programs. The company has gained national recognition for its culture as a top three Best Small Company to Work for in the U.S. for three years running as featured in FORTUNE magazine and recognized for its success by Portland Business Journal as one of Oregon's fastest growing companies for the past seven years. "In a world where customer service is becoming automated and impersonal, Ruby brings a high-touch, personal solution that gives small businesses a competitive edge," said Jon Seeber, partner at Updata Partners. "Ruby is run by a world class executive team with proven growth and performance for over a decade, and Updata looks forward to offering additional firepower to help Ruby innovate and expand even faster." "We focus on high-growth technology companies with proven success and are thrilled to be investing in Ruby Receptionists, building on more than a decade of financial performance," said Carter Griffin, partner at Updata Partners. "Serving the largest segment of the U.S. economy, Ruby uniquely leverages custom technology to deliver a personalized, seamless experience for small businesses and their customers." "Contrary to popular belief, inbound calls are the most valuable lead source for small businesses, and Ruby Receptionists provides a reliable, cost-effective solution by seamlessly answering inbound calls and ensuring prospects have the best possible experiences," said John Coelho, partner at StepStone Group. "Ruby's remarkable culture and commitment to customer service is truly best-in-class, and StepStone is pleased to support Ruby in its next phase of growth." Updata and StepStone will offer strategic counsel from the board level, delivering expertise and access to new technologies to support Ruby's evolution and continued growth. Ruby's staff and executive team will remain intact in the Portland area with strategic hires planned for 2015. To learn more about Ruby Receptionists or sign up for a free trial, please visit www.callruby.com. Hearkening back to an era when every call at an office was answered by a friendly receptionist, Ruby Receptionists provides personalized live, virtual receptionist services to thousands of small businesses throughout North America. Ruby leverages proprietary technology combined with bright, charming receptionists who live five core values -- Foster Happiness, Practice WOWism, Create Community, Innovate and Grow -- to deliver its unique vision of customer experiences. Founded by Jill Nelson in 2003, Ruby Receptionists has gained national recognition for its success being named FORTUNE magazine's #1 and #3 Best Small Company to Work for in the U.S. in 2012, 2013 and 2014, one of 100 Best Companies to Work for in Oregon and one of Oregon's fastest growing companies for seven years. Learn more at www.callruby.com. Updata Partners is a leading technology-focused growth equity firm with more than $500 million of capital under management. Updata invests in high-growth software, Internet, and technology-enabled service businesses with innovative intellectual property and market-leading solutions. Led by an investment team averaging more than 20 years of experience in the technology industry, Updata seeks investments where the combination of the firm's financial backing and the operating expertise of its partners will accelerate growth. For more information about Updata Partners, please visit www.updata.com. StepStone Group LP is a leading private markets firm that oversees approximately US$60 billion of private capital allocations, including US$11 billion of assets under management. It is a global firm with offices in New York, London, San Diego, Beijing, San Francisco, Hong Kong, São Paulo and Seoul. StepStone creates customized and targeted portfolios for the world's most sophisticated investors using a highly disciplined research-focused approach that integrates primary, secondary, credit and co-investments. StepStone leverages its unique global platform to optimize exposure to top performing investment managers in all strategies and geographies.